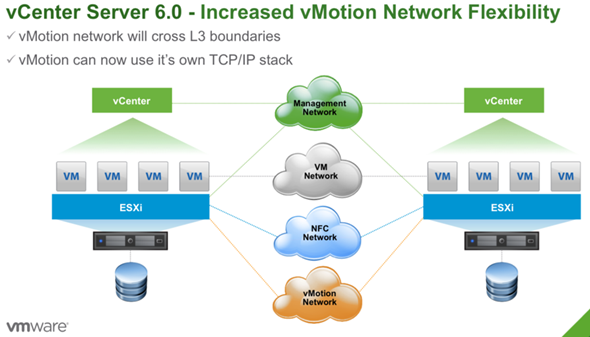 vSphere 6 brings further enhancements into vMotion. In the first article that has been published with details allowed at that time – vMotion Enhancements in vSphere 6.0 – Long Distance vMotion, Across vSwitches and Across vCenters I briefly introduced the new details, but some of them were still under NDA at that time. This is a game changer. Shifting workflows not only on premise but also off premise. IMHO this is huge and it opens very much other possibilities for DR plans and architecture. What if there is a huricane coming? No problem, just vMotion to another datacenter 500 miles away… Or is your local datacenter out of capacity? vMotion VMs elsewhere to free some capacity locally. Once more time the workflows became more portable, more agile, less tightened to the local only site. The major enhancement to vMotion this time (but it’s not the only one and it’s only from my point of view as it depends on what your interest is) is Long distance vMotion allowing to vMotion VMs from one datacenter to another(to remote site or cloud datacenter) and the requirements on this is to have a link with at least 100 ms RTT (previously 10 ms was necessary). As a network speed you will need 250 Mbps. Single SSO domain (same SSO domain to use the UI). With an API it’s possible to use different SSO domain. A datacenter was (until now) the highest point in the vCenter architecture…. But long distance vMotion can now get over it. Previously vMotion mechanism allowed to vMotion a VM within single VSS or single vDS. It won’t be possible to vMotion back from VDS to VSS. The requirement for this is remaining the same – L2 connectivity. 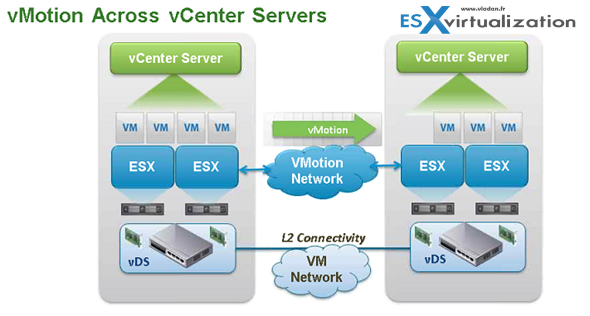 Both vCenters need to be connected via L3 network but the vMotion network needs to be a L3 type connection. The UUID of the VM remains the same (instant ID) no matter how many vMotion operations are done. What changes is the managed ID. vMotion will keep all the historical data, DRS rules, anti-affinity rules, events, alarms, task history and also HA properties are maintained. Standard vMotion compatibility checks are conducted before the vMotion occurs. As a network latency, there shall fulfill the requirements of under 100 ms Round Trip Time (RTT) …..
No vVOLs requirement is necessary or shared storage requirements. Same as for the vMotion across vCenter servers. vMotion over Array Replication with VVols. Note that I reported on VVols in this post in more details here. VVol SAN arrays can treat virtual disk which is stored on the array as an individual file (entity). VVol technology has granular control over VMDKs. Advantage over classic LUN approach is that during replication is possible to granulary select only VM (not the full datastore). vMotion is already compatible with VVols, so if you have an array supporting VVols it’s possible to have vMotion over Active-Active replication. the A-A replicated storage appears as shared storage to the VM and the migration over A-A replication is classic vMotion. You can vMotion using the replication bits which are already on the destination site (remote site). Then VVols reverse the replication back to the main site to assure SLAs are still up and your workloads stays protected. VVols are required for geographical distances. FT has 4vCPU VM support and 64 Gb of RAM per VM. The host limit with FT protected VMs is 4. From the networking perspective it’s required to have 10gig network as single FT protected VM will use 1gb (or a bit more) of network bandwidth. Here are all the features of FT in VMware vSphere 6. Update: vCenter server will be supported as FT VM in certain scenarios. The details and use cases were not uncovered yet! The snapshot feature will however still remain. So no manual snapshot for VMs runing FT.
FT Storage – FT VMs will need to have a secondary storage! 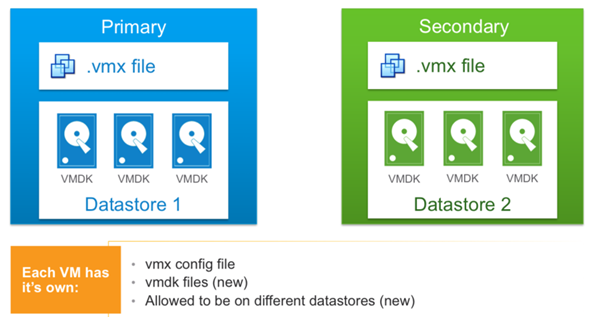 This is new as previously you could use the same storage (for primary and secondary VMs). It’s a hard requirement. The first resource which will gets exhausted by configuring VMs, it will be thenetwork bandwidth. Concerning an overhead. Yes, there is an overhead. (more latency…). The best way is to try and see how it goes in your environment. If a protected VM runs out of bandwidth (or the storage is slower for one of the VMs) then the VM will slow down the protected VM so the secondary VM can keep up…. Recommendation is a 10Gb Nic dedicated for FT.
vSphere HA in vSphere 6 got enhanced as well and introduces the component protection. It detects for example that the underlying storage has problems, so it restarts the VM on another host where it finds suitable storage. It detects All path down (APD), and Permanent device lost (PDL) situations. It will be an automated response to APD or PDL situations. some features in the hardware versions 10 and 11 are read only… see the table below…. NIOC v3 brings new enhancements. If you’ll need to upgrade an existing environment (from v2) you’ll first have to upgrade vDS to v3 and then you’ll have v3 of NIOC. It’s possible to reserve bandwidth and guarantee SLAs. It’s applied at the distributed port group level or at the vNic level and enables bandwidth to be guaranteed at the virtual nic interface on a VM. (there is a reservation set on the vNIC in the VM). Usual use case would be for service provides wanting to guarantee network bandwidth between multiple tenants.